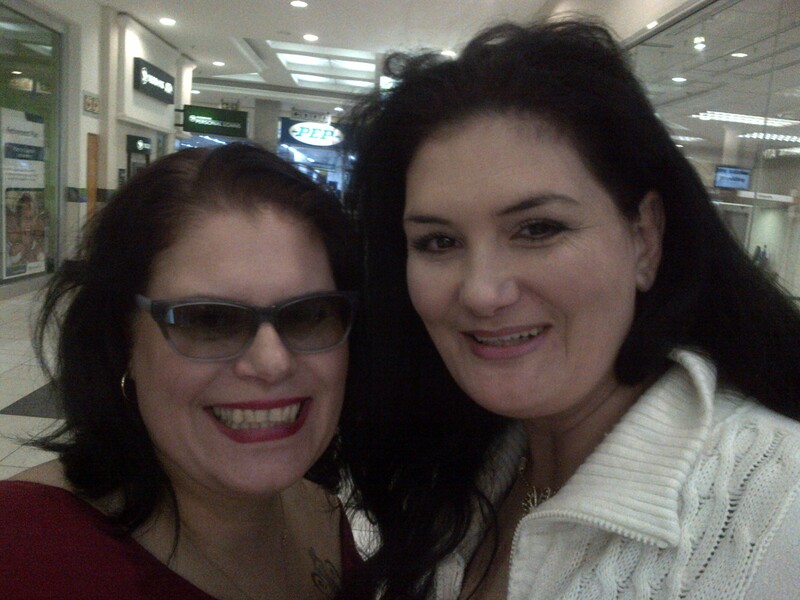 My younger sister, Rentia and I. For my sister Rentia. Let me write this to take flight on the wind so it will blow into your window this morning my sussie. I l♡ve you like summer rain. Sunshine on a winters day. Rentia always orders Lime milkshake and no garnish on her plate. I saw yesterday she writes little notes to remind herself of where she went that day and whom she spoke to ’cause her memory isn’t good. She put a giraffe sticker on yesterdays page cause it is my favourite animal. I am not sure I can make it without her. I watched her *smile* in finding a R10 pair of fluffy socks. Come to me all who is broken hearted and I will give you rest…those words may be in the Bible – but it describes the bravest woman I know. In Rentia I find an invincible summer. She starts where I end, begins where I falter. She picks me up, dusts me off and tell me she will slay the dragons while I watch her not remember her name. Rentia doesn’t judge, but says what the hell were you thinking suster? She doesn’t live in a glass house. She isn’t intentionally rude but she won’t lie for your benefit, but she doesn’t throw stones. She knows my kids intimately. She makes it her business to ask, find out, talk. She is proudly “Aunty Rencha”. She made me a godmother to what is most precious to her, her 16 year old daughter, Tayla-Jade. I may not be so good with God but I am so thankful he took the best of Rentia and Joe and made that angel girl. Rentia forgives. Accepts. Loves her God and tries sincerely to understand my fascination with Judaism. She doesn’t mind that I l♡ve tattooing myself. She says, “that’s Stel!” She doesn’t care if I am loud, or crying. She knows human emotion and it doesn’t scare her. One of the things I l♡ve most about her. Vulnerability is a strength. Anything less is a lie. You will never say a negative thing about her husband Johan, her daughter, or about our Mammie Yvonne or our Dad Alex. She is especially fiercely protective of my Liam James. Should her physical health allow – she WILL take you out for hurting what is precious to her. Rensch, I saw how tired you were yesterday. How hard you tried not to show your pain getting in and out of my car. You don’t want sympathy or anybodys sorry. You say this is life, tick the box and move on. Whatever it is, you deal. How proud I am of you. Calm and full of JOY you were yesterday when we could only get 5 days worth of meds when you need 30 – simply cause we don’t have the money. You thank me for doing nothing. I thank you for doing everything. When people say you don’t look sick. Please remind them that they don’t look stupid. I l♡ve you from my grey hair to my blue toenails. PS. No bribery was exchanged for the writing of this blog. 🙂 Just l♡ve. What a wonderfully written tribute to your sister. I recall reading an earlier one where you explained she was ill. The ability to write so well through your feelings, and allow us the chance to sit with you during your “stuff” is always so powerful. Your sister sounds like someone who takes your breath away …. And there my comment just disappears! Let’s try again. This made me cry a little, laugh a little and think a little. I wish I could bottle you and sell you ’cause I’ll make millions. The love you have just makes my heart leap. You are both lucky to have each other as sisters. Sad post 😦 Shows the love you have for your sister. This is incredibly moving. Sorry. I have no other words. I haven’t read it, but found it via Rentia so I just love you and am not a stalker!! !